English 19. oktobris, 2018. 23. decembris, 2018. In February this year, the U.S. Department of the Treasury Financial Crimes Enforcement Network (FinCEN) came out with an unusually harsh report on ABLV bank in Latvia and imposed sanctions against this bank. The FinCEN report specifically mentions bank shareholders who institutionalised money laundering as one of the pillars of its activities, avoiding and circumventing the execution of law enforcement authorities’ requirements, and resorting to bribery in 2017 in order to influence Latvian officials in matters affecting the decisions of controlling or law enforcement institutions that could reflect upon their business and prevent imagined risks to their business. This is what the official FinCEN report on ABLV states. Both corruption and the fact that the shareholders were not in fact planning to change anything about their business, are mentioned twice in the report, alongside a number of examples from ABLV business practice. One of them includes the involvement of ABLV in stealing over a billion U.S. dollars from Moldova. Anyone is free to get acquainted with this very interesting document, which certainly is very important for Latvia: https://www.fincen.gov/sites/default/files/federal_register_notices/2018-02-16/2018-03214.pdf. The consequences of the U.S. FinCEN report are known to everyone. The bank shutting down was a shock to many. A major financial institution on Latvia’s scale, which actively supported cultural and artistic processes – had some error perhaps occurred? Or had the U.S. partners possibly mixed something up? What was the corruption and influencing of officials that America was talking about? The owners of the bank were evidently the ones promoting the conspiracy theory of slander by former Bank of Latvia president Ilmārs Rimšēvičs, who had allegedly had a personal dislike towards the bank. This nonsense is hard to take seriously. Since 2003, FinCEN has only proposed such sanctions for twenty-six banks worldwide. Sanctions like this are not introduced frequently, and they always result from painstaking work by FinCEN. The report itself states that it has passed all necessary U.S. inter-agency consultations, and anyone with an approximate understanding of how organisations like FinCEN actually work refused to believe the fairy-tale plot proposing that Rimšēvičs’ personal distaste had been to blame for it all. That FinCEN could have based its report on someone’s spoken allegations concerning the bank is unimaginable. This sort of thing simply does not happen. Clamouring about the lack of presented evidence is entirely out of place here. The FinCEN’s goal is to protect the financial system of the U.S., not to prove corruption within Latvia. It is clear that the information obtained as a result of the investigation is not always valid for submission as evidence in a criminal trial – which would endanger both the sources and the methods of the investigation. This is all utterly clear. What is noteworthy is that internationally recognised money launderer Oļegs Fiļs (pictured second right), who has recently become famous for claiming even glasses and saucepans from his former wife and taken by her as household items when she moved out from their home – and for accomplishing the initiation of a criminal case (evidently by means described by the U.S. government) against his ex-wife for allegedly intending not to repay a loan due in 2027 (that’s right, the trial concerns the allegation that she was planning not to repay the loan in 2027, nearly ten years later!) 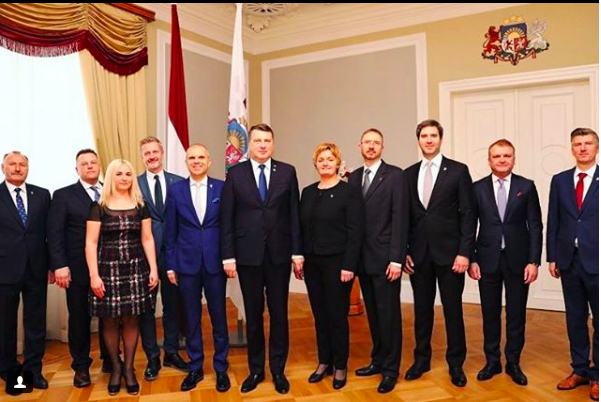 – this internationally famous money launderer whose bank has been sanctioned by the U.S., suddenly visits the President of the Republic of Latvia to discuss establishing a government in Latvia. And the President shakes this man’s hand and listens to his advice on how government should be made. Which makes me wonder – what do our U.S. partners think of all this?